Bora Bora is everyone’s picture of a romantic South Pacific Island. Upon arrival by cruise ship, we see castle-like Mt. Otemanu jutting up into the sky. Green tropical slopes greet us as the ship docks just offshore of Vaitape, the island’s main settlement. 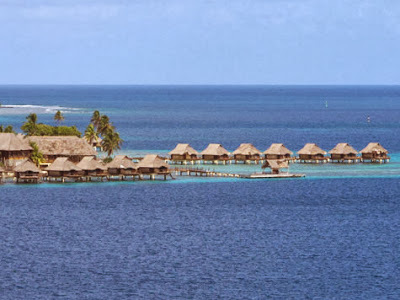 Bora Bora is an island in the Leeward group of Society Islands of French Polynesia in the Pacific Ocean. Surrounded by a lagoon and barrier reef, Bora Bora’s landscape is dominated by two prominent peaks, Mt. Pahia and Mt. Otemanu (which has the highest point at 2,385 feet). These mountains are remnants of the extinct volcano which created the island, now an international tourist destination. Bungalows over the water provide an excellent escape into paradise. Between the peaks are valleys filled with 50 varieties of hibiscus blossoms in orange, white, yellow, pink, red, and more. Plentiful coconut trees, pineapple plants, and small but very sweet bananas grow on the main island and smaller islands called motus. White sand beaches and emerald waters, along with colorful fish and giant manta rays swimming among the coral gardens, attract visitors to this tropical paradise. Dependent on tourism, the island is famous for its luxury resorts, some of which feature bungalows built on stilts over the water. Lagoon trips to snorkel, picnic on a private motu, cruise at sunset, or view the perimeter of the island by speedboat or motorized canoe, are very popular. There’s no public transportation, but you can rent cars or bicycles to get around. If you’re not in a hurry, try one of the trucks that the locals use—which run on island time. 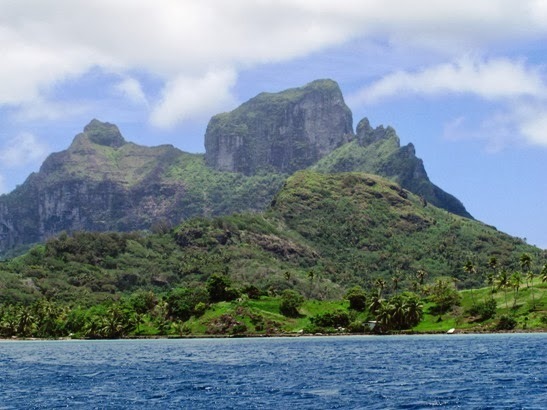 The island’s original name was Pora Pora, meaning “first born.” There is no B sound in Polynesian language, but early visitors misunderstood the pronunciation. Polynesians settled on the island in the 4th century, and the famous explorer James Cook landed and mapped the island in 1770. London missionaries arrived in 1820 and established Protestant churches, still the most prominent religion today. After the Oceania Marina docked, Larry and I took the three-minute tender ride to shore and wandered around until time for our speed boat excursion circumnavigating the island. The front section of the boat had bench seats, but back where we sat were saddle seats that reminded us of riding a horse. As we circled Bora Bora, streams of water splashed beside the boat shining like sparklers in the sunlight. I got soaked when the jet boat captain opened up the throttle to give us an exhilarating ride. 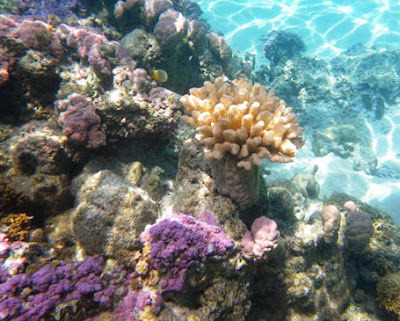 Snorkeling at the coral garden in the lagoon was outstanding. We stopped at a magnificent coral garden in the lagoon, one of the best snorkeling spots on the island. 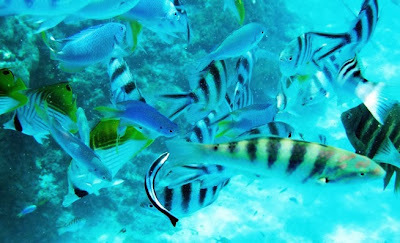 The reef teemed with colorful tropical fish flitting among dozens of coral species in the pleasant water. With sunlight gleaming, we were able to take many stunning photos of undersea life. Back on the boat, one guide entertained us with songs on his ukulele, while the other guide served a refreshing plate of tropical fruits. I can't name all the fish, but they were really beautiful. As the journey continued, the guide slowed down to point out a huge cannon on the side of Matira Point, a rusty remnant of America’s role in helping defend Bora Bora from the Japanese during WWII. Nearby Matira Beach is Bora Bora's most famous public beach because of its long stretch of gleaming white sand as fine as powdered sugar. Palms swayed in the sea breeze as we stopped on a sandbar just off Matira Beach for a short swim before completing our boat ride around the island. 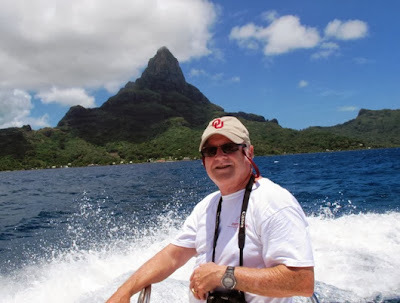 It was a lovely way to view Bora Bora and left no doubt why visitors come to relax and rejuvenate among spectacular island scenery.